Is Andre Villas-Boas beginning a new career in motorsport? When Andre Villas-Boas decided to escape from Mourinho's shadow, his rise was nothing short of meteoric. In his sole campaign at Porto, Mourinho's former protégé completed a brilliant treble - the Primeira Liga, Europa League, and the Taca De Portugal. Such was Porto’s dominance in the Primeira Liga that they finished 21 points ahead of their closest rivals Benfica in a remarkable unbeaten league campaign. AVB also became the youngest coach in history to win a European competition, at just 33. André Villas-Boas soon became the hottest young coaching talent in Europe. So, it was no surprise that Chelsea came calling. AVB was soon placed in the hot seat, and he anointed himself as 'The Group One'. To many Blues fans, AVB was a clone of his mentor, which made expectations unrealistically high. After a string of poor results, Villas-Boas’ credentials were suddenly called into question. He did not help his cause when he tried to phase out senior members of the team, such as Drogba, John Terry, Lampard, Michael Essien, and Cole. It became increasingly apparent that AVB was on borrowed time and he would face the chop soon. On 4 March 2012, following a 1–0 league defeat against West Brom in the Premier League, owner Roman Abramovich cut his reign short after just nine months. The following season, Tottenham Hotspur decided to gamble on AVB after sacking Harry Redknapp. AVB guided Spurs to 5th place with 72 points - the highest points tally ever achieved by any club in the Premier League that did not finish in the top four at the time. The cracks started appearing in the relationship between Chairman Levy and AVB, the following season when Gareth Bale was sold to Real Madrid. Levy decided to pull the plug after a series of disappointing domestic league results, which included a humiliating 5-0 home defeat to Liverpool. Despite his failures in England, some suitors on the continent were still intent on procuring his services. Villas-Boas next went to Zenit St Petersburg where he won the Russian League in his first full season. After rebuilding his reputation at Russia, the Portuguese relocated to China with Shanghai SIPG. Villas-Boas made his exit from China soon and decided to compete in the Dakar Rally in 2018. A self-confessed motorsports enthusiast, his interest in the Dakar Rally stretched back into his youth when his uncle took part in the event back in 1982. "The Dakar was in my mind for quite some time. Racing runs in the blood of my family, and my dream was to do the Dakar one day," Villas-Boas told the official Dakar Rally website. 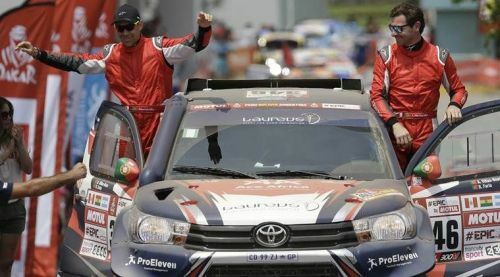 Villas-Boas drove a Toyota Hilux in the race with Portuguese compatriot Ruben Faria. However, he withdrew from the rally after crashing into a sand dune on the fourth stage in Peru, damaging his back. In March 2018, he participated in another off-road rally Baja TT driving a Can-Am Maverick X3. It remains to be seen whether Villas-Boas will continue his racing career or return to the dugout at some point.